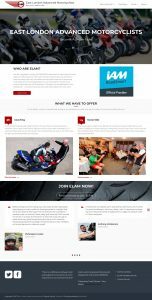 As well as working on this blog, I am involved with the East London Advanced Motorcyclist (ELAM) group and over the last few months have been revamping their website. That’s my excuse for the somewhat sporadic updates to on this blog recently. The group’s old site was pretty dated, but was WordPress based so plain sailing to update with a theme change. Fresh photos were sourced and page layouts reworked make things more engaging. Whether the IAM is something you’ve considered or not, take a look, any feedback would be much appreciated.